It's all about London! I'm using the Artistic Outpost Loverly London plate today. I thought I'd take this happy face and add a wee bit of steampunk to lighten her mood. 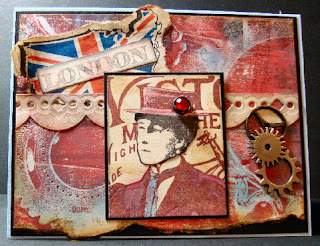 The background is made with my Gelli Plate and nestie gears. Enjoy the hop and come back again later this month for our latest releases. LOVE that background you created! Fantastic showcase for the beautiful AO images! 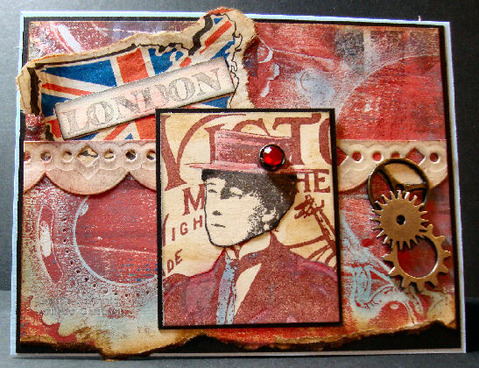 Wonderful steampunk inspired card! Great card, love the grungyness of it. Hi Gerrie! I just love the red tones of your card. So unique and eye catching! Gorgeous layout, too. Cheerio! Yeap, I can see I am going to have to get my hands on one of those plates! Too cool are those backgrounds! Love this, GF! The colours are stunning as is the stamping. Wonderful shabby feeling to this and the addition of the cogs is wonderful. I am such a fan of Steampunk. your background looks great with these images. Hi Gerrie! Great card for the hop! Love the red pin on the hat idea. I need these stamps right now! Love the gears and the red jewel brad. Perfect finishing touches. Gorgeous card Gerrie, love the Gelli background! Fab use of the London plates! Love your Gelli background, colors and added gears! Love those colors! These two will be my next purchase. I love them. I gotta get some of those Gelli plates. Your background is so cool!!! Love the crinkled paper. Awesome background with the Gelli plate, Gerrie! Wonderful colors and I LOVE how you stamped on the fabric! Love the jewel in the hat too! Love the background. She does look like she has a bit of an attitude! Your colors are perfect for OLDE Loverly London! Awesome piece. The gears are a great addition. Glad to see you're back in the studio! Fab card, GF! Love the London theme!